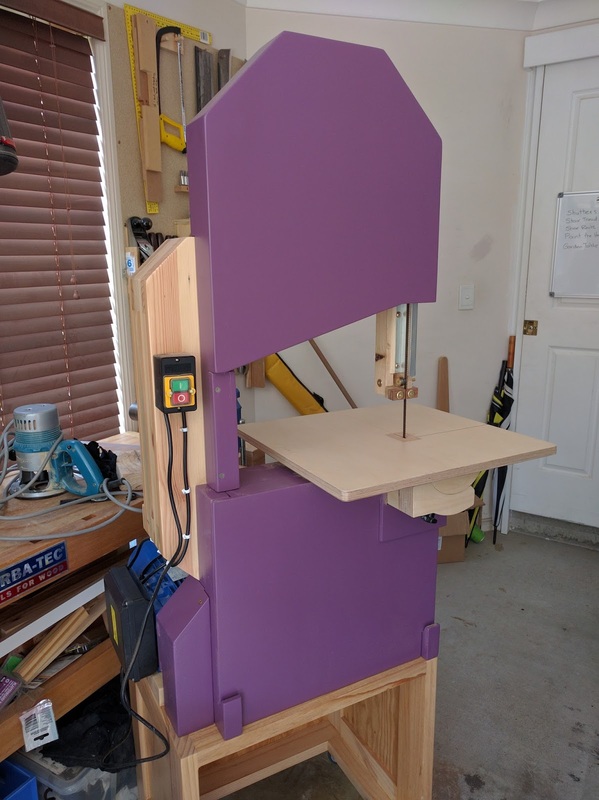 As I've mentioned in previous posts, I have been wanting to make Mattias Wandel's wooden bandsaw for a while. The whole process has been a great learning experience. In particular, I've developed an appreciation for how small mechanical changes can have a huge impact on performance. 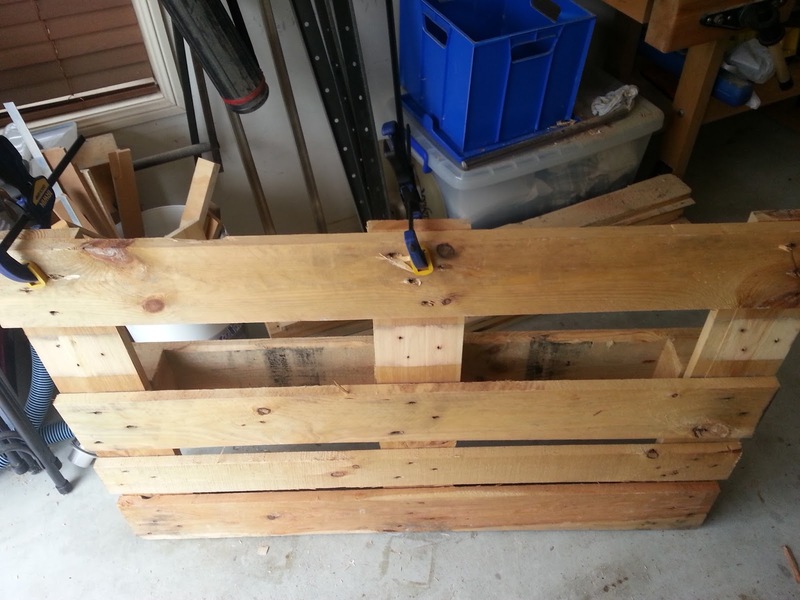 I started this project with the aim to keep the cost low, primarily for the challenge, but I also like the idea of building something from second hand materials. 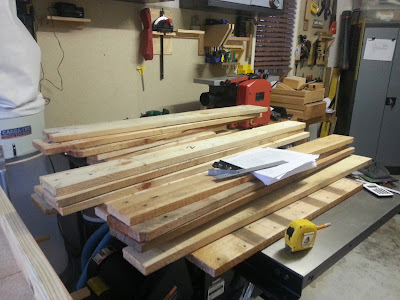 My plan from the beginning was to use (free) pallet wood for the laminated pine frame. 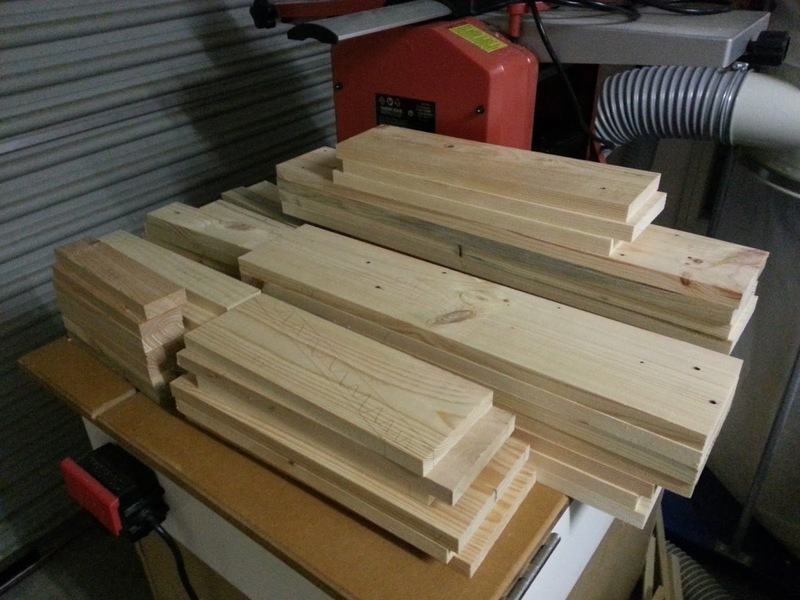 It took three pallets to get enough good timber after planing and thicknessing. Each board ended up being around 18.5mm thick. The plans call for at least 17mm so this worked out well. One of the coolest things about this design is the laminated pine frame. By laminating the layers of relatively weak pine boards with the grain crossing the direction of the previous layers at the corners, you can build up a very strong, very stiff wooden frame. In order to ensure accurate alignment of the various components later in the build, it is important to make sure the frame has very little twist. 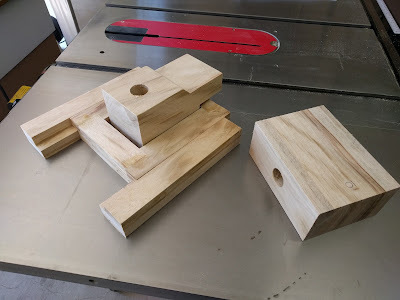 I used the technique outlined by Matthias in his Bandsaw Mill video to do this. The flattest surface in my shop, big enough to do this, is my table saw table, so I used it as the reference surface for the first few layers of lamination. As per the suggestion in the plans I left off the base of the frame until after I attached the bottom wheel mount. 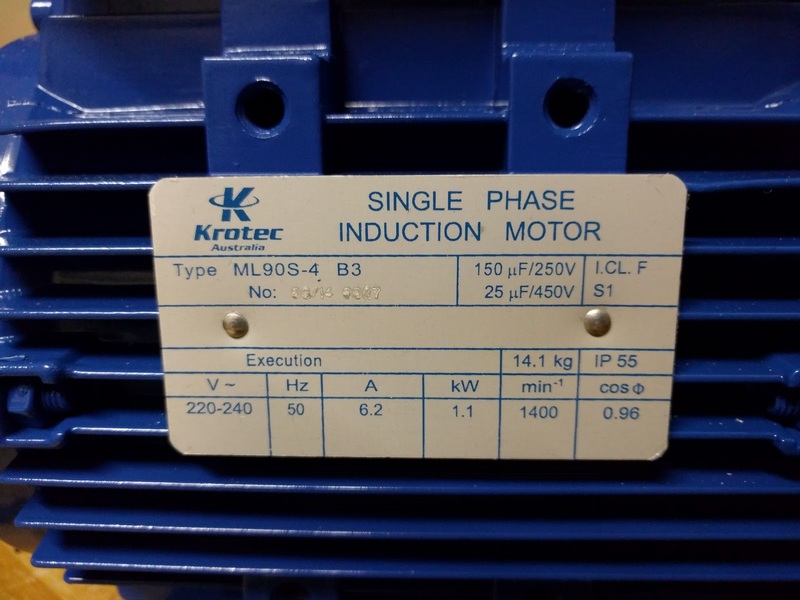 I had previously tried to find a good second hand motor without much luck. 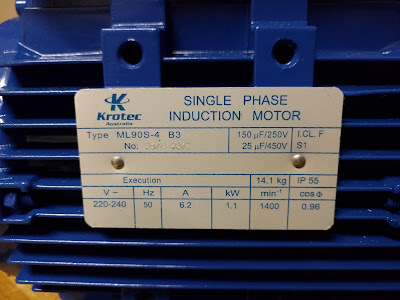 In the end, I deviated from my "do it super cheap" plan and bought a reasonably priced new Krotec motor from ebay. 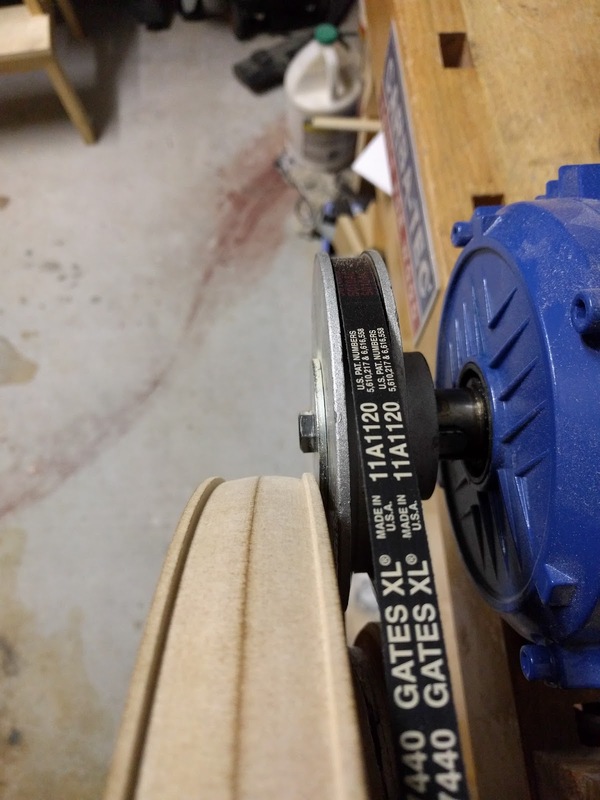 The price (including shipping) for a brand new 1.5 HP motor ended up being less than AUD $150. 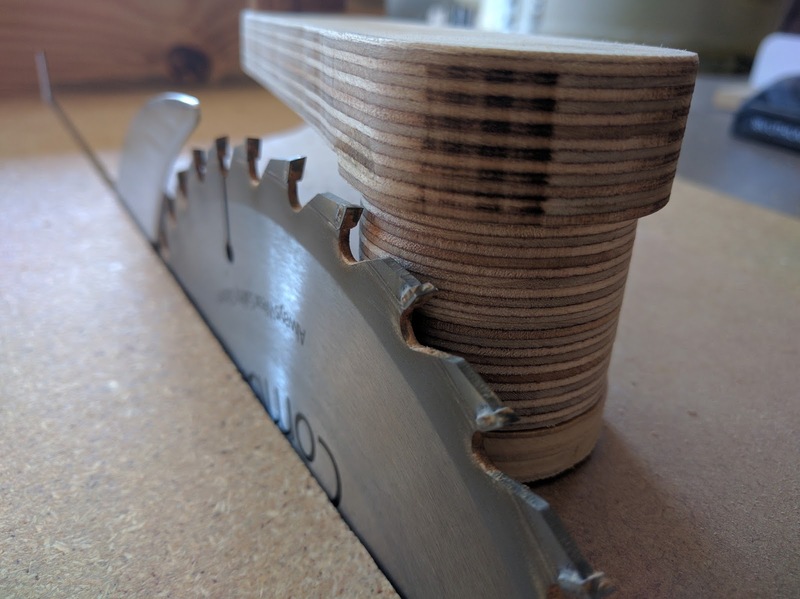 Having not had much experience actually using a bandsaw, I was unsure how fast to run it. I did a bit of research on similar sized bandsaws. The Jet JWBS-16B for example is a 16 inch bandsaw that runs at 3000 SFPM (around 15.24 m/s). However on Marius Hornberger's Bandsaw wheel upgrade video, he mentions that he prefers his faster blade speed of 21 m/s (about 4134 SFPM). My plan was to settle somewhere between these two extremes and I created a spreadsheet to determine my final pulley sizes. I already had a pulley from the junk motor that fit on the shaft of the new motor, so I decide to base my design around that. In the end, after a few mishaps that resulted in my drive wheel pulley being smaller than intended (around 23cm diameter), I have ended up with a blade speed closer to the Jet JWBS-16B. 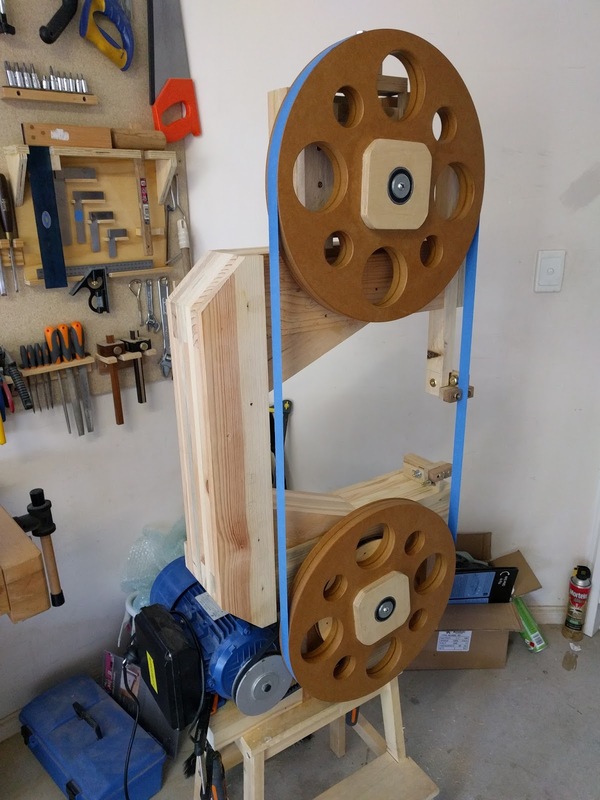 One of the other features of this design that makes it unique is that the wheels and drive pulley are turned true on the final bearings. 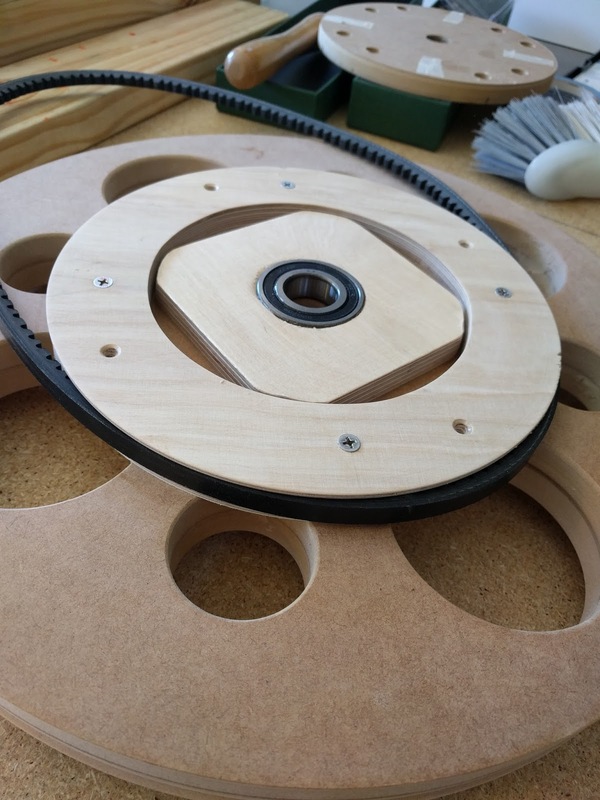 The ball bearings are tightly pressure fit in Baltic Birch plywood flanges that are glued directly to the wooden wheels. The wheels can be any stable wood product that will not expand or contract like real wood does. 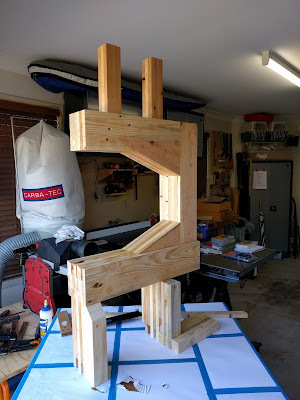 MDF works great because it has a much more consistent density than plywood and is easier to balance later on in the build. It is heavy though so I followed Marius Hornberger's design and lightened them with large holes. 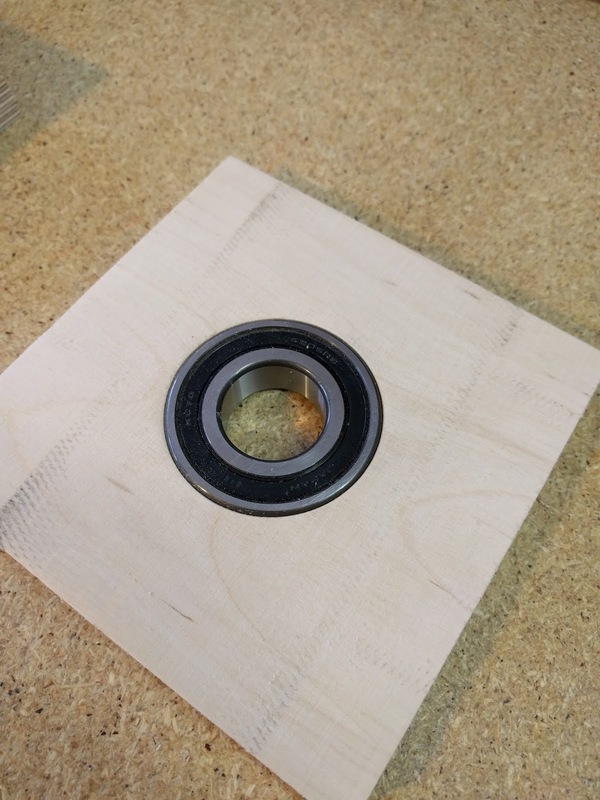 These holes were incredibly difficult to cut on my under-powered drill press. 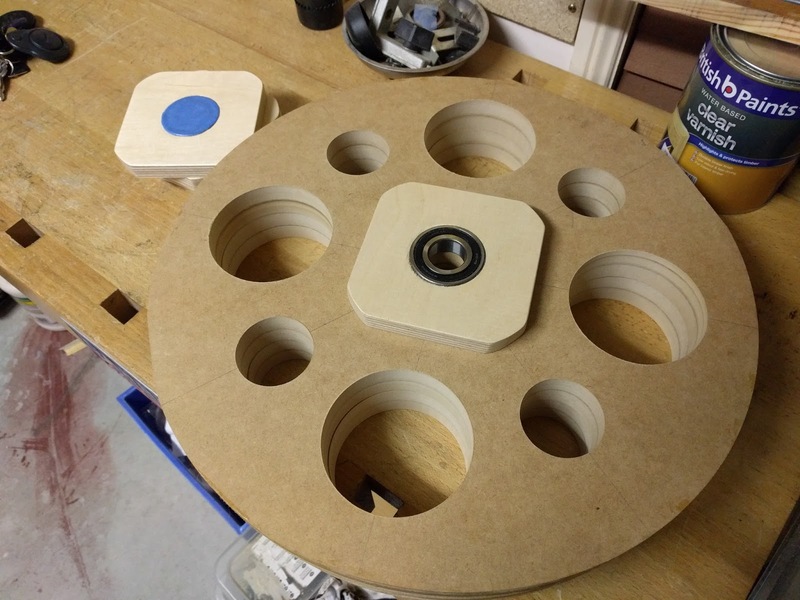 It took many hours, but the hole pattern does look pretty cool once complete. The next step was on of the most challenging for me. 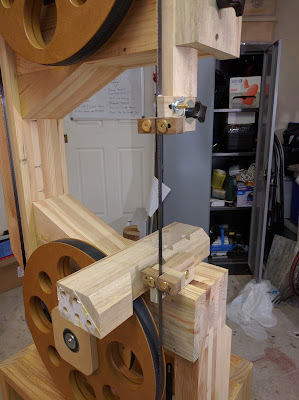 The design calls for you to mount a temporary pulley to each wheel and use the motor to turn the wheel like it's on a lathe. I had all sorts of trouble getting this to work correctly. 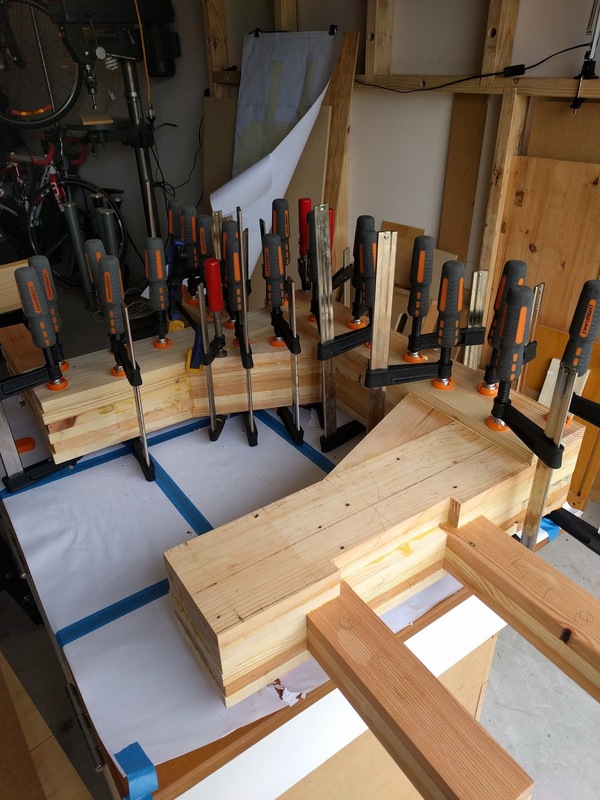 When I first started, I only owned bench chisels. It is possible to turn the wheels using bench chisels but it definitely requires more skill and a strong hand to maintain control of the shorter tools. They also heat up easily and chip like crazy. 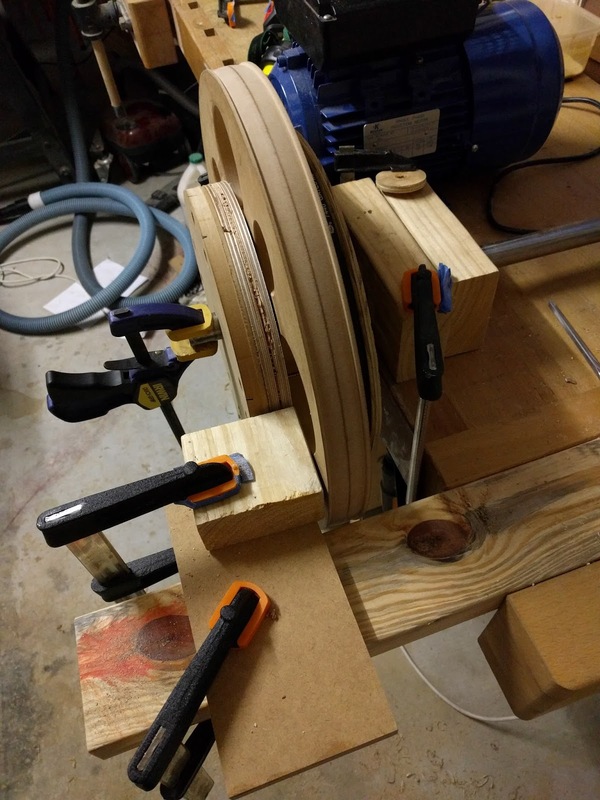 I completed all of the MDF wheel profiles (again Marius Hornberger's design) using the bench chisels. My first tool rest worked ok for the MDF, but I was unable to turn the birch plywood pulley with this setup. 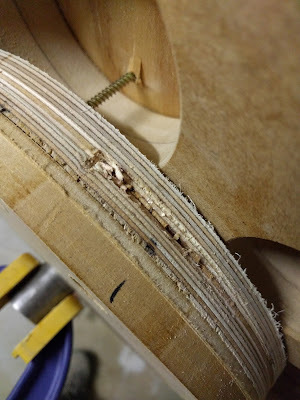 As soon as I tried to do more than lightly graze the birch plywood with the chisel, it would gouge and I would get a very big fright as the whole setup was thrown out of alignment with the motor still running. 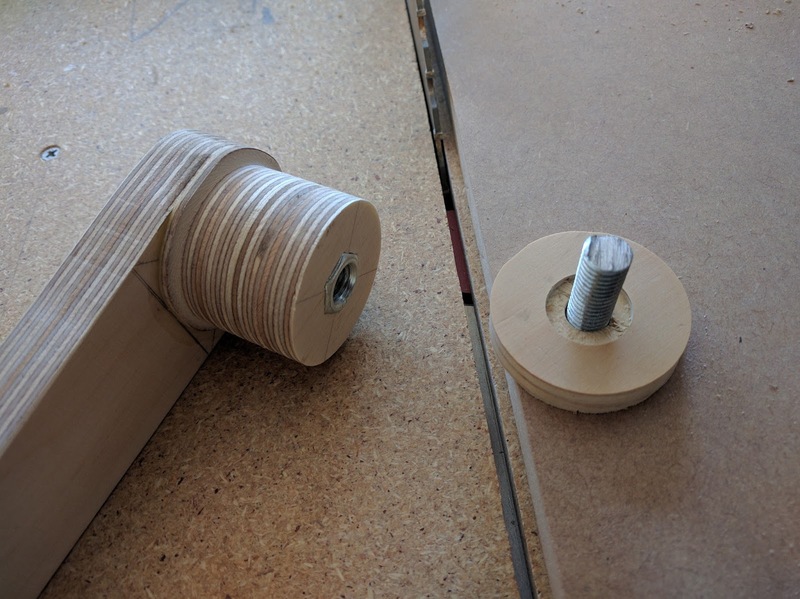 After much frustration, I decided to make my birch plywood pulley blank as close to round as possible in the hope it would make turning easier. I removed the birch pulley and attached an MDF template that I cut with my router compass I then used the router table to trim the plywood flush to the template. Unfortunately it didn't make a huge distance. The tool may catch if it's not well enough supported, and if it's aimed into the wood. If you angle the chisel down a little bit, then the scraping action pushes it out of the wood instead of in. Same for cutting on the side, chisel should be angled out of the wood slightly. 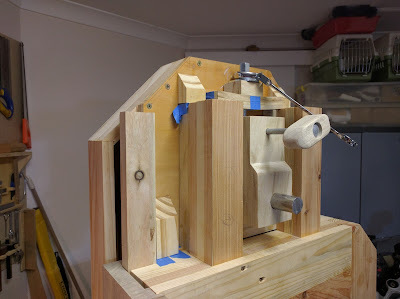 It's much more efficient turning with the chisel angled into the wood, but if your support is not solid enough, that doesn't work very well. This all made a lot of sense, but I really thought my setup was quite stable. However as soon as I added a vertical support, things went much smoother. I also decided to buy a carbide turning tool. The longer handle made a huge difference for controlling the cut and the carbide is very sharp. The parting tool tip made cutting the pulley profile much easier as well - turning with a 6mm bench chisel is really quite challenging. 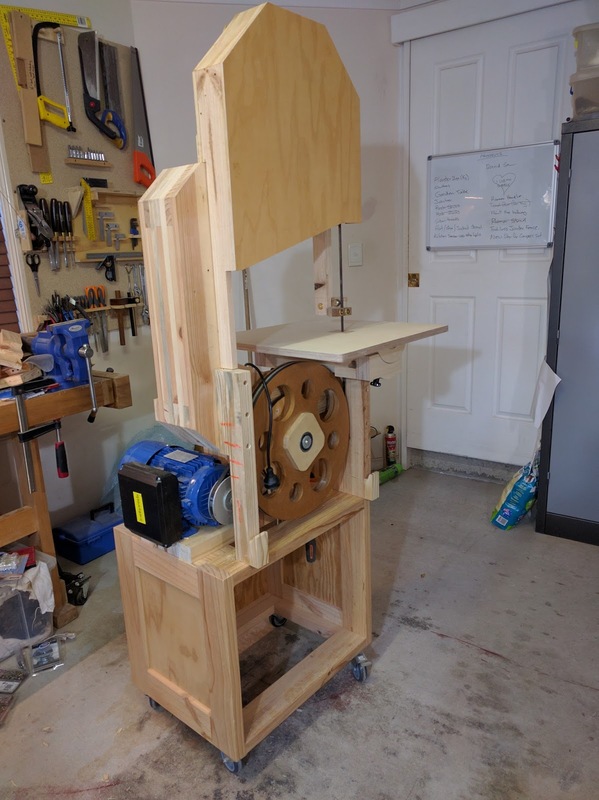 The next few months (I procrastinated a lot) were filled with working out how to mill the various hardwood and plywood components. 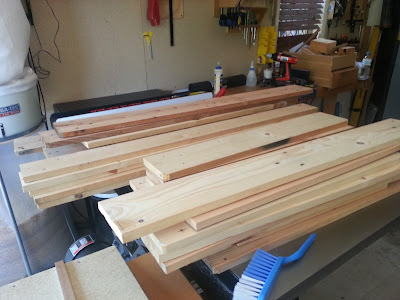 For the hardwood, I used camphor laurel. 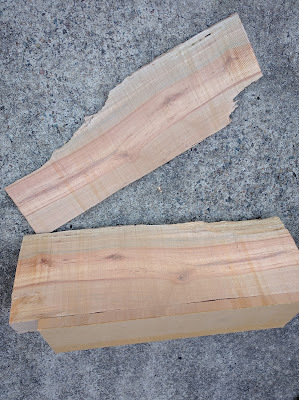 It's cheap (because it's basically a weed) and I had picked up a few boards at the local woodworking show. It's a bit stringy when cutting it, but the shop smelt pretty nice for a while. For the guide block I used some random hardwood I had picked up along the way. It felt pretty dense, so seemed like a good choice for the guides. At this point in the build I realised I needed a way to test the bandsaw, but I didn't have a blade yet, and to be honest, was a bit too scared to put one on right away. I created a test "blade" using 2 opposing layers of blue masking tape. It worked quite well. At some point I finally made it out to Carbatec to buy a cheap 10mm 6 tpi blade. 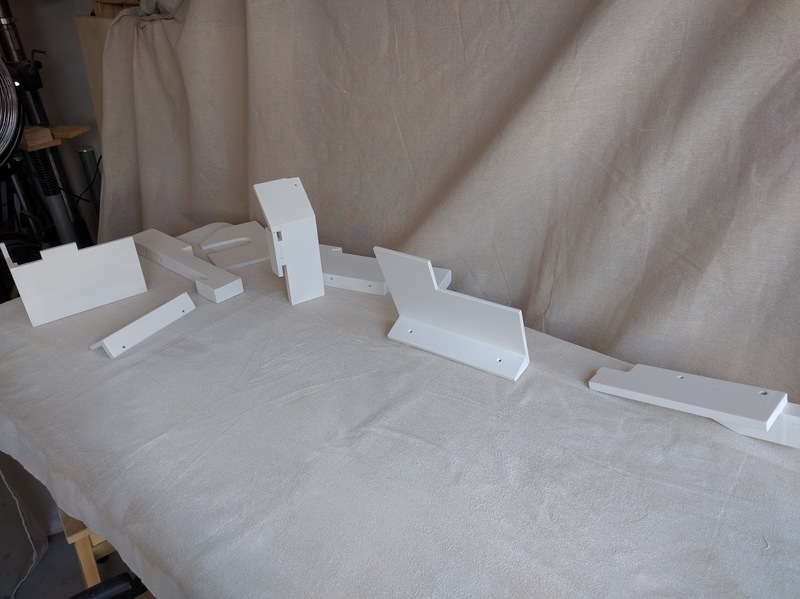 The next few weeks were then spent making all of the various enclosure pieces. I was originally going to modify the enclosure design, but by this point in the build, I didn't really have the drive to try to design something new. I just wanted to be done. 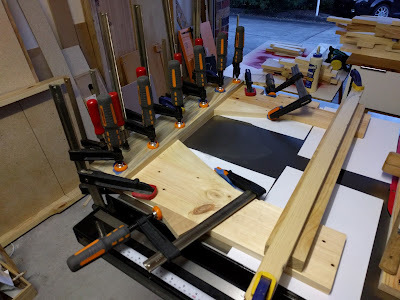 Around this point in the build, I was quite busy with my day job and it felt like every time I came into the workshop I was making a huge mistake and then spending 2-3 times as long as it should have taken fixing it. One of the most annoying mistakes was the blade tensioning handle. It should have been pretty straight forward, but I forgot to take into account the top blade cover and it didn't fit. To reduce the size, I setup a quick jig on the table saw where I could spin the handle while slowly bringing the blade up next to it. In the end, this worked pretty well. One or two of the screws holding on the bottom pulley had vibrated loose and started tearing into the frame of the saw. 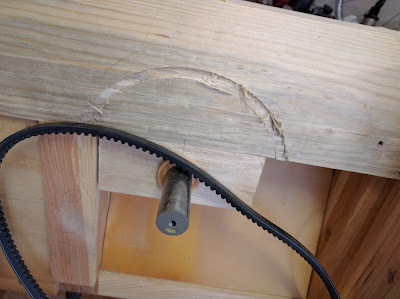 Since I hadn't tuned up the saw yet, it was still running pretty rough and I think this is what caused the screws to come loose. I had to replace one of them with a higher gauge to make it tight again. I'm going to keep an eye on this going forwards, but my hope is that if I reduce the vibrations, it won't happen again. Finally it was time to paint. I want to do some spraying for a future project and managed to pick up an Earlex HV5000 2 stage HVLP system on Gumtree for a pretty good price. It hadn't been used and cost about as much as a single stage system from Bunnings. 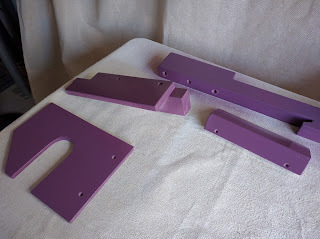 I wanted to use the bandsaw finishing as a chance to practice some spraying. For all of the painted pieces I did an undercoat with a water-based primer followed by an acrylic paint. It was about 400% humidity so it took a while for the paint to stop being tacky. I finished off the painted pieces with a coat of water based polyurethane and sprayed 3 coats of poly on the non-painted parts. Once everything (finally) dried, I spent a weekend putting it all back together and tuning it up. I re-balanced the wheels and shimmed the crap out of various bits. 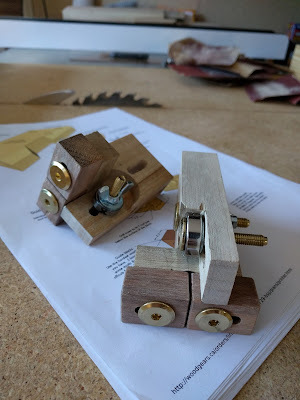 In particular, my top wheel was out of plane with the bottom so I had to shim one of the L-shaped rails to pull the wheel forward on one side. Disappointingly after all this work, it still didn't pass the coin vibration test. It was definitely better, but not as good as I wanted it. I narrowed this down to the bottom half of the machine and plan to address it at a later date. I also installed a cheap machine switch I got off eBay. 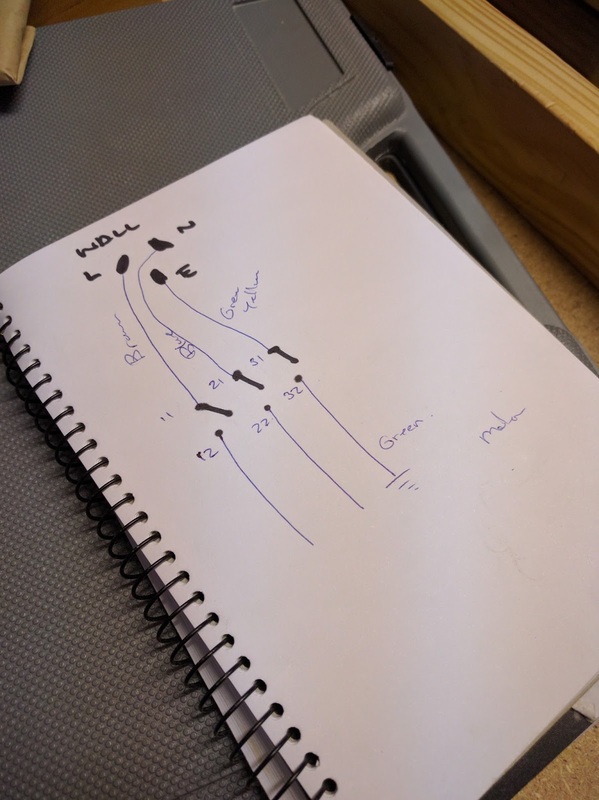 Having never wired up a switch before, I spent a bit of time trying to work out what to do. In the end, it turned out to be really simple. A quick test with a multi-meter showed that the switch simply cuts the connection for all three power lines (live, neutral and ground). The last piece to make was the metal blade guard. I bought a cheap cookie pan at a dollar store and cut it to size. 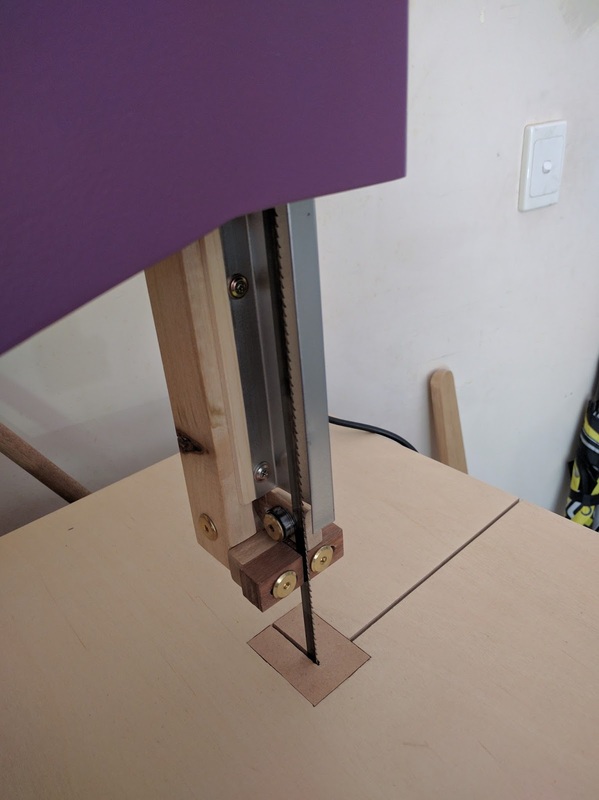 As I don't have a sheet metal break, I clamped the sheet metal between some boards and used a mallet to percussively persuade the piece into shape. 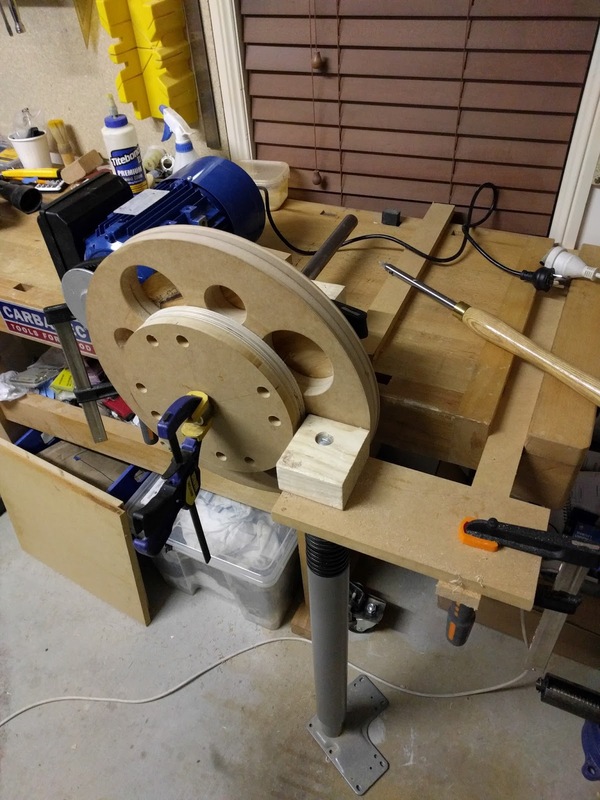 It, of course, wasn't the right size as I forgot to check the clearance with the top wheel (which I had shimmed earlier to bring the wheels into plane), so I just shimmed the blade guide to bring it forward as well. 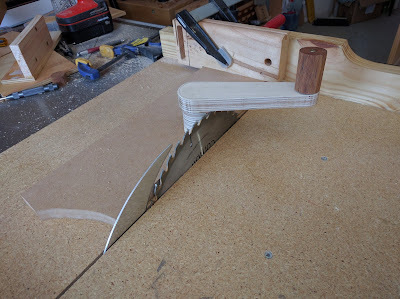 Finally, the saw is more or less done. I suspect I'll be reworking some things over the next few months until I'm happy with it. In particular, the vibration issues are really quite annoying and I think they are affecting the cut quality quite a bit. It's difficult to tell because my skills with the bandsaw are also quite poor. I need to mess around and practice a bit more until I get the feel for things. 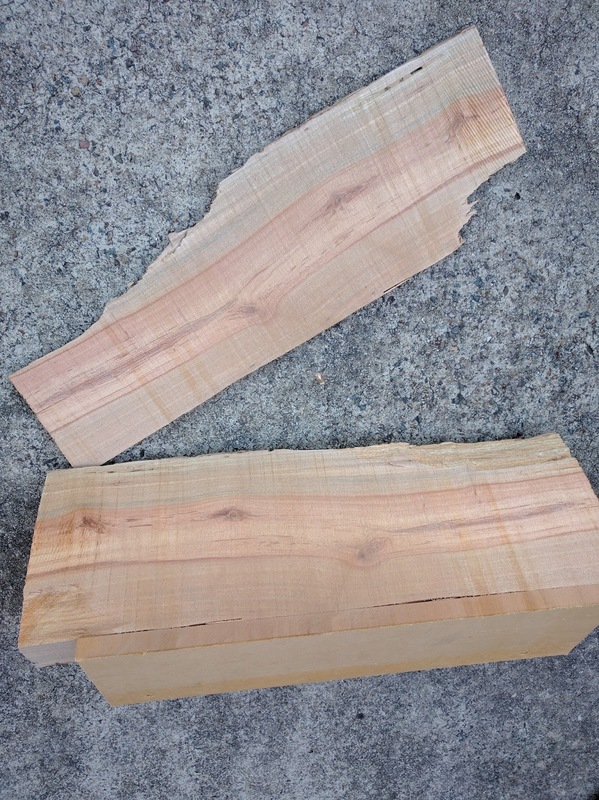 I have a couple of small logs that I have been waiting to cut up, so I started breaking these up with the finished saw. I was still using the 6 TPI blade - which is not really appropriate for this work - but it seemed to work ok, I just had to cut very slowly. Finally get to see the grain inside!